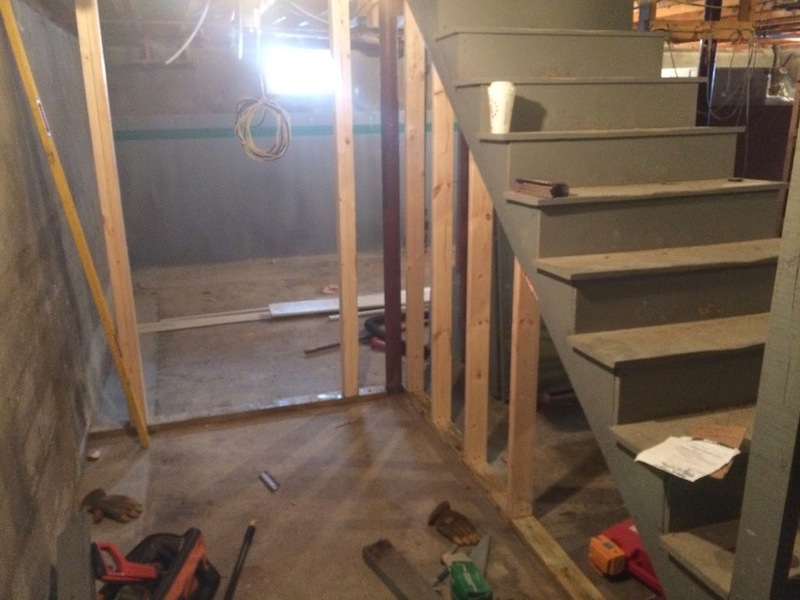 So, while this was the last room to get started, it's the first to get finished - go figure! And look how much it's changed since we got started. 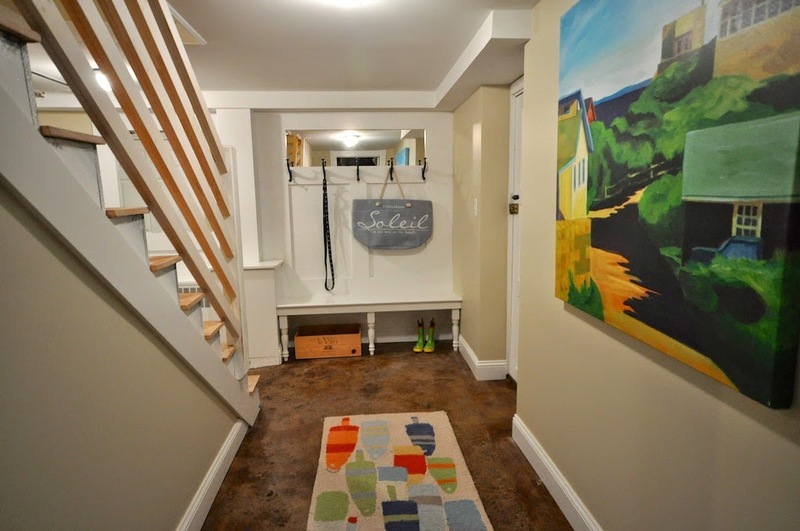 While we debated over whether to have a mudroom off of the garage, once we got started, we created a lot of nice features. First and foremost, we have a wall of custom built ins. There's a bench for putting on boots, just as you come in from the garage. And there are lots of hooks for coats, hats, leashes, etc. We've included a couple of mirrors, so you can do a last minute check, before you walk out the door. We also put a radiator in the space, to keep it toasty warm on a cold winter day (and it's pretty nice for drying gloves, we've all had a chance to test that this winter!). And behind this door, you have the water meter for the whole house. It's easy to get to, behind this clever magnetic hatch! We also created this large closet. 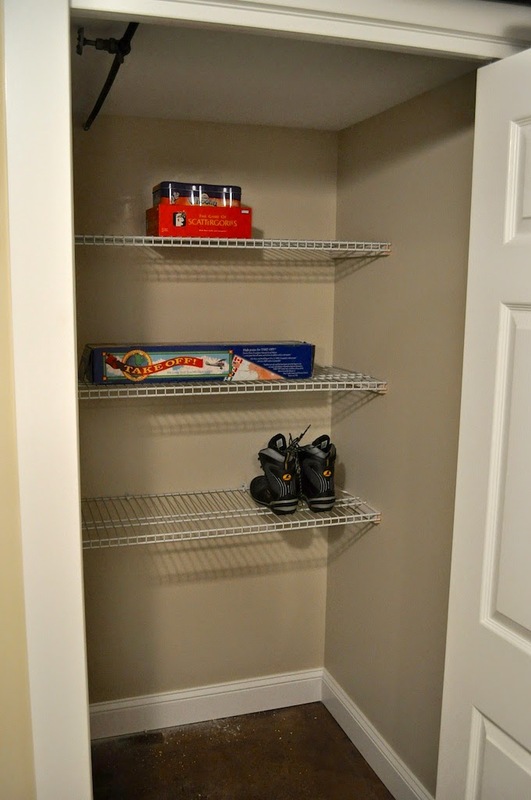 It's great place to keep sports equipment, games, toys, etc. For lighting, we used metal marine fixtures. They put out a lot of nice light, with a nautical flair. And the acid etched concrete floor will provide a hard wearing surface for whatever abuse the homeowners can provide! 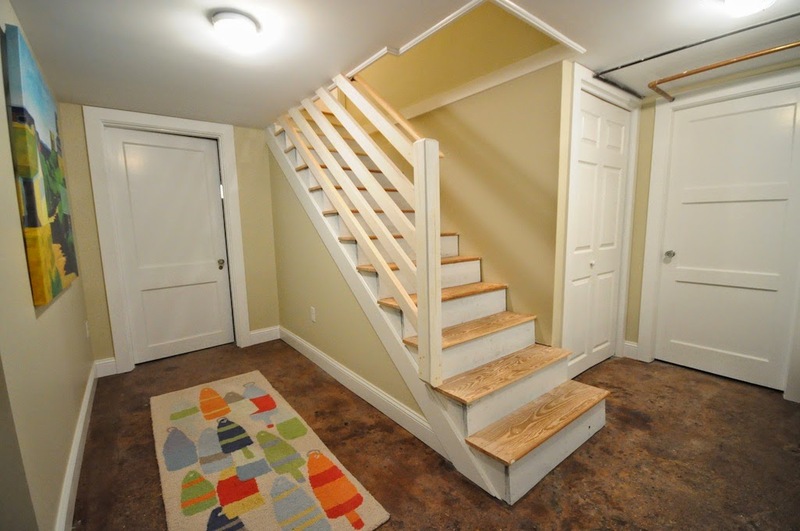 We agonized long and hard over whether or not to finish off this space. But given how nicely it's turned out, we're glad we moved forward with it. And we think the future owners will be too! So much nicer than coming through a cold, dark basement entrance! Super job! Mud room envy. 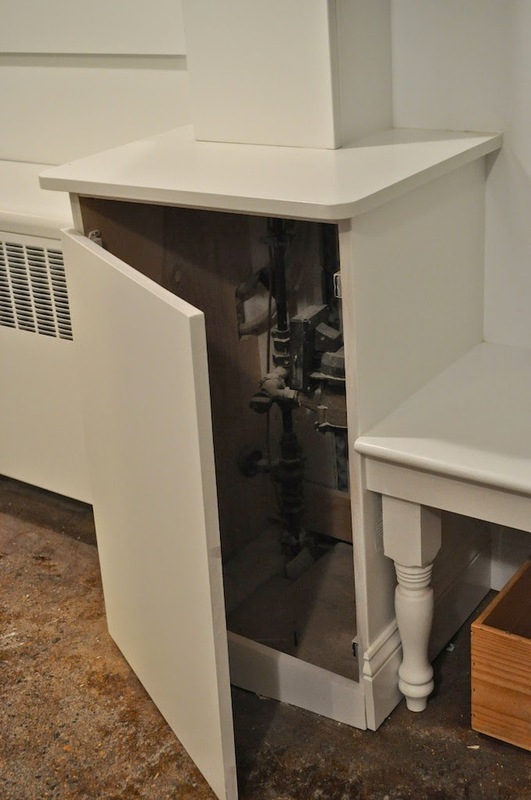 I'm amazed by how quickly you do these projects, including incorporating ideas that really give a custom finish. 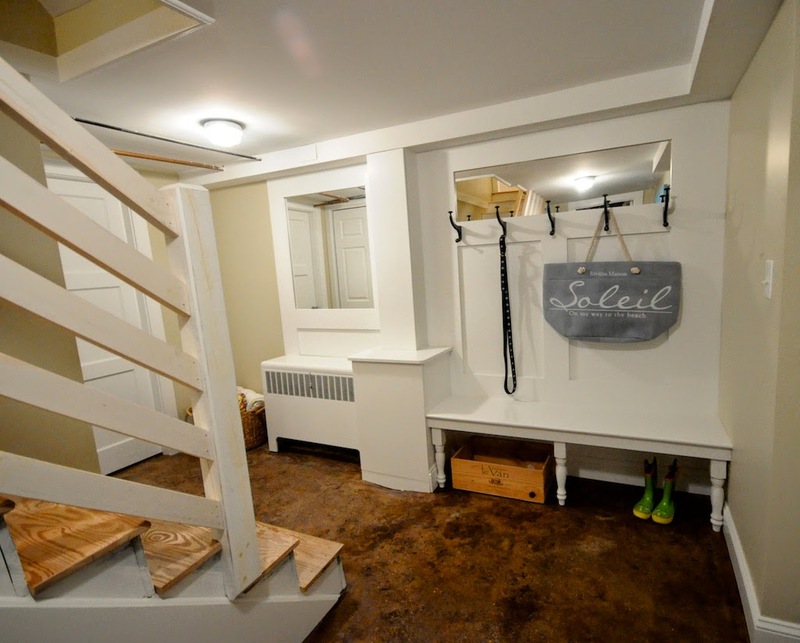 Actually, I have mud room envy as well. We don't have one in our own house. And with the start of mud season, I'm already tired of wiping muddy paws!! So happy I found this blog! You do amazing work! I love the buoy rug, where did you get that? Thanks Courtney! I bought the rug from Garnet Hill last year. Not sure if they still carry it, but it's a great rug! Buy Local - Sometimes Really Local!